Everybody knows what a farm looks like, don’t they? The same goes for a factory, a mine, a power station. Although the scale might have changed, they are all still recognizable from their forms of 50 or 100 years ago. The Fourth Industrial Revolution will change that. It will melt the boundaries – and the limitations – of large, economy-defining industries, transforming how they look and what they produce. And it will do that because it will be powered by 5G. Why? 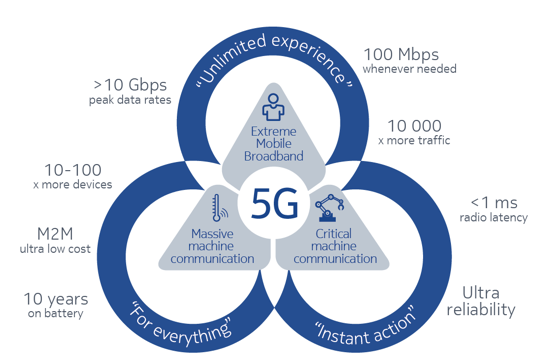 Because 5G is more than just the next step up from 4G. It possesses unique characteristics that make it socially and economically transformative: low latency (in other words, almost imperceptible lag when carrying out remote orders); fast speeds (around 10 times faster than today’s networks); connection capability (enabling up to 1 million linked devices per square kilometre); and unparalleled reliability (allowing new precision-based applications). This technology is already here. The world’s first 5G networks were rolled out in the US and Korea last year. China, Japan, Australia, Finland – and many other countries where governments have actively pushed 5G adoption – will soon follow. And the important thing is this: businesses and governments shouldn’t wait for 5G and the Fourth Industrial Revolution to come to them. Business models are already changing. If you want the early adopter advantage, this is the time to move. What do those changing business models look like? For one example, look at Nokia’s own “conscious factory” in Oulu, Finland. The vast majority of the factory is now automated. Its temperature and humidity automatically change to keep machines in prime condition. Parts are delivered using autonomous vehicles. Equipment carries indoor GPS, allowing managers to see exactly where it is, what it’s doing and whether it could be used or positioned more efficiently. All this makes the facility highly customizable. Everything apart from the walls, floor and ceiling can be moved around. And of course, there is ubiquitous connectivity between robots, workers’ tools, and the underpinning network. The bottom line is that the Oulu factory has leveraged connectivity to become one of the most flexible, versatile, and productive factories anywhere in the world. Those three characteristics – flexibility, versatility and productivity – are at the crux of the Fourth Industrial Revolution, and they are not just limited to manufacturing. As 5G gains traction, every business will be able to take advantage. Industries such as healthcare, agriculture and transport will be able to optimize processes and act on real-time data analytics, resulting in a huge boost in productivity. This breadth of applicability is particularly important. Previously, digitization has benefited a relatively narrow section of even the most developed economies. In the US, for example, just 30% of industries (such as financial services) have shared 70% of the benefits of digitization. This has allowed them to increase their productivity growth rate nearly four times faster than other industries. The Fourth Industrial Revolution could make those gains far more equitable. Wider access to the cloud, for example, would allow all enterprises – regardless of size – to improve productivity and processes. That isn’t to say that the benefits of the Fourth Industrial Revolution will come easily. There is a reason why a bank is easier to digitize than, say a farm: it is because a farm, like a factory, an oil rig or any other physical industry, has a huge range of machinery, tools and systems, each of which requires a different form of optimization. The key to creating efficiencies is by controlling these physical assets using digital technologies. This is only possible if information technology and operations technology are combined, allowing companies to leverage their own data to analyse, optimize, and control their complex systems. In order to arrive at this new stage of digital transformation, there are three priorities. 1. Connect everything. A business needs to know the state of its assets and be able to control those assets in real time, regardless of their location. 2. Compute in the wild. The cloud is still too centralized. New developments such as autonomous drones need uninterrupted, zero-latency connectivity, delivered by so-called edge clouds, which push applications closer to assets and users. 3. Make data sweat. Currently around 90% of data available on a factory floor isn’t even gathered. But greater connectivity and edge cloud will give us a wealth of real-time information, which can be instantly analysed and acted on. As a result, trains could be preemptively rerouted during flooding, factory drones could automatically redirect parts to where they are needed most, and first responders could analyse the scene of accidents before arrival. 5G can help to unlock each of these three priorities. Particularly when businesses work with partners like Nokia who can provide seamless, trusted end-to-end products and services. I will say one more thing. We only have one chance to get it right. For too long the benefits of digitization have flowed disproportionately towards a small set of industries, leaving behind hospitals, farms, and other vital social assets. The world is waking up to this. At this year’s WEF meeting in Davos, major players in the communications technology sector – including Nokia – agreed to work with others to identify and overcome the various technical, regulatory and organizational challenges that currently block the path to 5G’s broadest possible adoption. This is only a first step. More are necessary. Governments in particular need to step on the gas and prioritize 5G adoption. But if ever something was worth working for, it’s this. I firmly believe that the sooner governments, businesses and individuals have access to 5G, the sooner the Fourth Industrial Revolution can help people all over the world enjoy safer, happier, more productive lives.